The Zoning Board meets quarterly to discuss any zoning issues, building permits and etc. Special meetings are held if needed due to an application for a building permit comes in requiring a meeting, these special meetings are paid for by the applicant. Public Hearing Notifications and for zoning board salaries if a special meeting is required. 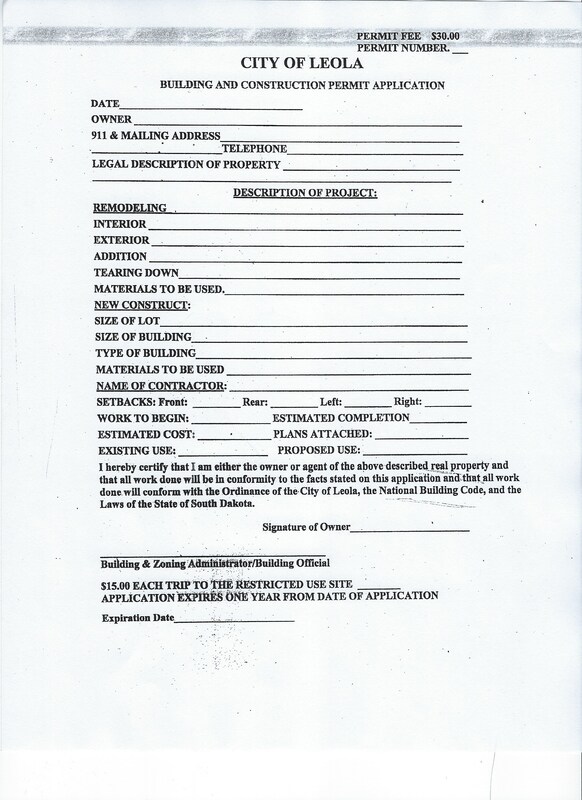 Moving building out of city limits requires the permit plus a $2500.00 bond and pay 7.5% of the building assessment. Moving a building within city limits requires the permit plus a $500.00 bond. Any costs incurred by the city to meet conditions will be deducted from bond before any refunds. Permits are required for all new structures, additions, and all remodeling over $500.00. There is no need for a permit for painting or shingling.